“When performance is measured, performance improves. When performance is measured and reported back, the rate of improvement accelerates.” – Pearson’s Law. You might have heard of the “Don’t Break the Chain” calendars, where for each day of work you get a big red X, line up a consistent month and you get an unbroken chain. It’s a great idea. But for me that wasn’t enough ,it makes you feel nice when you make your chain, but you get no idea of when you’re slacking off or even how much work you’re actually doing. We all know about the 10 000 hour rule, that it takes 10 000 hours of deliberate practice for a person to reach expertise in a certain area. Well if that’s true, then I’ve made a Mastery Calendar. I only write down hours of deliberate practice, not when I’m outside looking at things, not when I’m reading or thinking about what to do, but only when I sit down and do the work do I get my hours for the day. When you first do this you might be surprised at how little work you actually do, just take a look at my first weeks, I thought I was doing a lot then, it turned out to be about 1 hour a day, I was spending so much time thinking about what to do or procrastinating, not getting up early enough or checking my email every 15 seconds, thinking what YouTube video to play as background noise while I doodle something for a minute. I wasn’t getting anything done, but I thought I was. I also couldn’t keep myself in one place, I needed to do other things, sitting down and studying or painting is great, but only for about 7 minutes, then you realize all the other things you need to do, washing the dishes becomes very appealing, paying a bill becomes a matter of life and death, you hear a noise coming from the other room so you build a fort and hide under the sofa. And that’s another day gone by. The precious few hours you could have used for your dream – spent on a soap opera , a video game or empty gossip, something that you don’t even remember you did. And don’t get me wrong, I procrastinate just as much as the other person, it’s no easier for me than for anyone else, discipline is a daily battle, not a personality trait. I just make it hurt more if I don’t do the right thing. I’d stay up late if I have to or I’ll get up at 4AM and do my work before I go to work, I don’t care if it’s a holiday or a birthday, weekend or day out, no days off, you put your hours in and you move forward each and every day. You can rest when you’re finished. The Mastery Calendar is just a simple idea to keep yourself accountable, no matter what you’re doing or where you are – there’s no one else that’ll do the job for you, no one will pull up the slack, each and every step is your own and no one will push you forward. Even if you have teachers, parents or friends giving advice and cheering you on – it’s still all up to you, no one can do the work for you. We all have a limited time to do the things we want to accomplish, learn to value and budget your time, learn to say “no” to things that are not going to get you where you need to go, stop wasting your time on irrelevant, empty entertainment because you’re too frustrated, lazy or scared to start. Just get going and don’t stop until it’s done, there are no secrets. Thanks very much for the offer, but when I start work again this coming Monday, I pretty much won’t have any free time left, I work alternating shifts and I literally do get up at 4AM on some days when I won’t be able to find any other time to study in, so everything will be pretty hectic and I don’t want to say “Yes, I’m in” and then not be able to do any of the things you guys are doing, so thank you very much, but I don’t think I’ll be able to join. Let me know if you guys need any help though, I’m thinking of a fundamentals video next, maybe that might be of some use. I see, well thats ok, but if you have time, just add me up in skype ill add you to a chatty chat room , its were we conveniently chat to any time of the day,skype foxfire1345. And most certainly, a foundational video could be an utmost help. Looking forward to what you come up with. Btw , just subscribed in here. I blabbered too much already , gotta get back into studying, have a good day! Thank you man 🙂 I’ll do my best, I can’t make any promises for when it will be done, but it will be done, I promise you that, I’ll keep you updated too. Good luck to you guys, I hope you have a great group going. Helps a lot to keep going with it, I just downloaded a ‘Don’t break the Chain’-calendar for the beginning and i’ll if it will help me out. I just downloaded a ‘Don’t break the chain’-calendar for the beginning (never heard about it before). Do you count *any* drawing time? Or purposeful planned out drawing time? For instance would be sketching out in the world count? How about study time? I would really love to do this, because it’s also a nice thing to brag about! Haha. Trying to figure out how to answer your question makes me convert everything into numbers and it makes the numbers seem more powerful than the work 🙂 For me it’s just a way to find out how much time I can possibly devote to practicing on a daily basis, while still going to work, paying bills and doing everything else that needs to get done. Once I find that number, everything is just checking to see if I’m working as hard as I can or if I’m slacking. I guess the simple answer would be – if there’s purpose behind it and it’s in alignment with my goal – I count it. And I always round the hours down a bit, just to keep motivated and know there’s still more that can get done. Haha, I understand! More calendars! Yes!! 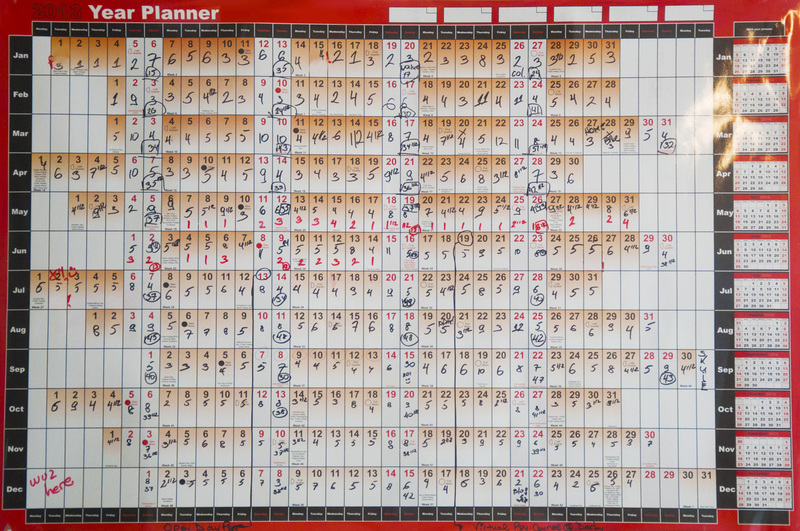 I made my own calendar (portable) in openoffice, I am pretty stoked about it. I think this is totally fun! And so did I:) u r few hundred hours ahead:)) but not to worry I will catch up!